"You're rocking the boat. They don't like that." A comment I heard just this week... one woman chatting with another woman about how she did it... how was she able to overcome the overwhelming gender bias in this industry and join a team with an employer who actually cares? How did she do it? By not rocking the boat. I've had this ... I guess we could call it a "conversation" with myself at various points in my life. Usually it's when I'm getting washed ashore and clinging to dear land, gasping for air: Oh, geeze. I rocked the boat too hard, again! And everybody, like, freaked out. They threw me overboard! How dare they!? Why did they do that? Because I rocked the boat. Because all they can see is that their boat is getting rocked. If only they could see... logical questions have logical answers. 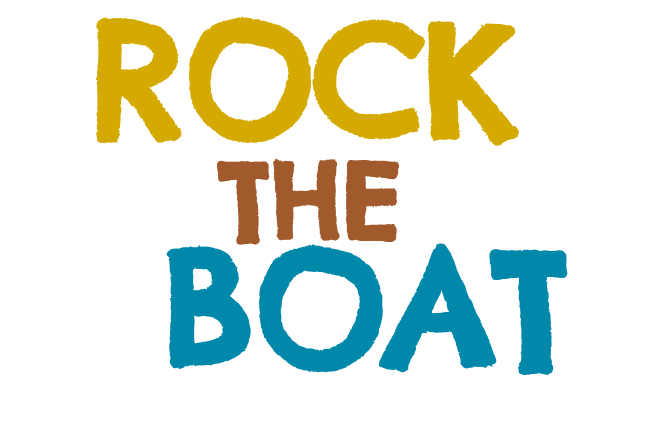 It's not the boat rocker who ultimately destroys the boat and ruins everything; it's the boat rocker who exposes the vulnerabilities of the boat and can help everybody be more prepared. Before it's too late. But the key is that ... you've gotta let the boat rocker stay on the boat. Having somebody who's not afraid to push the limits of our boat is a good thing. The dearth of women and women in leadership roles in technology is obvious to anybody who has worked in technology. Once in a while somebody will create a little movement ... some noise or a "non profit" or a summit or something. But these blips are hardly ever noticed on the larger radar. They fade and disappear. People forget. Men keep getting promoted over women, and they almost never have to fight quite as hard for the raises or pay they deserve. Venture capitalists keep gladly seed-funding extras from The Social Network. Firms from A...Z (pardon the pun) keep gladly throwing millions at startups which have been documented to willfully discriminate and retaliate against women. My two cents for the conversation is pretty simple: there are only two different kinds of humans in the world: Those who actively exploit women, and those who actively speak out against the exploitation of women. Keeping your mouth shut for fear of rocking the boat -- this is a form of apathy all its own. The exploiters have general strategies: when she's smart, competent, hard working, and nice, underpay her. She's easy to take advantage of. Besides, when we really drill down and look at things, she just doesn't deserve the same basis as the guys on her team. Or better yet -- why allow her to be part of the company at all? Why not make sure she's thoroughly plundered of her wages by a middleman "temp agency" or headhunter? The more fear and job insecurity you can instill in her, the harder she'll try. The other strategy the exploiters take is this: when she's smart, competent, hard working, and strong enough to stand up for herself, the exploitation takes the form of failure to hire, hiring with a longer "probation" period, bullying, biased performance reviews, or the ultimate insult of getting fired. I've tried both the "nice" and the "strong" approach, and the unfortunate reality is that neither one really works. The number of people who actively exploit women is still too big, and the quantitative number of women who aren't afraid to rock the boats is still too small. But I'm not about to stop rocking boats. Because it's not the boat rocker who ultimately destroys a boat. It's the boat rocker who exposes boats that simply do not possess enough integrity to handle the seas. And those are boats I don't wanna be on anyway.